VATICAN CITY (CNS) — Mass isn’t a paid arrangement for salvation but rather the commemoration of Christ’s sacrifice of his life, given freely to all, Pope Francis said. Christians can make a silent prayer during Mass or donate money to offer a Mass for a loved one who is in need or passed away, but should never feel obliged to make a payment, the pope said at his weekly general audience at the Vatican March 7. “Nothing! Understood? Nothing! You do not pay for the Mass! The Mass is Christ’s sacrifice, which is free. Redemption is free. If you want to make an offering, do it. But you do not pay for it! This is important to understand!” he said. Pope Francis held the audience in the Vatican’s Paul VI hall due to forecasts of rain for Rome. The Vatican also opened St. Peter’s Basilica to accommodate the overflow, with giant screens set up in the basilica so the people could follow the audience. However, despite predictions of dreary weather, the sun brightly peered through the clouds above St. Peter’s, which the pope noted after the audience, when he went to the basilica to greet and bless those inside. “Today, we thought the rain was coming, but who can understand Rome? The weather in Rome is like that,” he said. 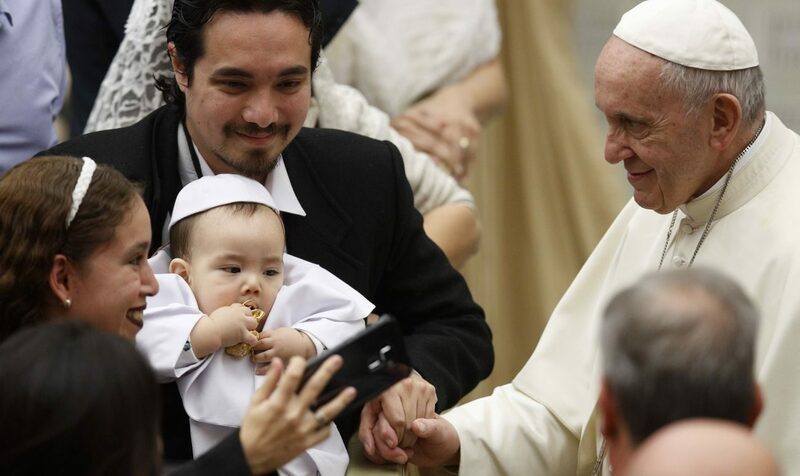 “In this solemn prayer, the church expresses what it does when she celebrates the Eucharist and the reason why she celebrates it, that is, to make communion with Christ truly present in the consecrated bread and wine,” the pope said. “It is beautiful to sing, ‘Holy, holy, holy is the Lord.’ It is beautiful to sing it so that the entire assembly unites their voice with those of the angels and saints to praise and glorify God,” he said. During the consecration, he added, the bread and wine become the body and blood of Christ; it is “the mystery of faith” that all Christians must believe in. “We should not have strange thoughts such as ‘How can this be?’ It is the body of Christ, and that’s it. Faith; faith helps us to believe, it is an act of faith. But it is the body and blood of Christ,” the pope said. Pope Francis said that through the eucharistic prayer, Christians “learn three attitudes that should never be missing from Jesus’ followers:” to give thanks always and everywhere, to make one’s life a gift of love and to build communion in the church and with everyone. “This central prayer of the Mass educates us, little by little, to make of our whole life a ‘Eucharist,'” the pope said.